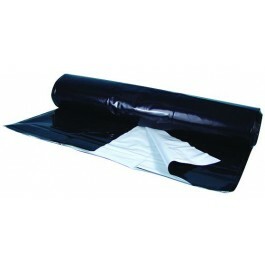 Used in growing areas - this is waterproof poly film that is black on one side & white on the other. Panda film works well as a reflective film (reflects 90% of the light striking it back to the growing area), or as a room partition. This is a very heavy duty film at a thickness of 6mm. Mount Black & White Poly on the walls of your indoor garden or hang it from the ceiling to create light-proof partitions. The white side reflects 90% of light and the black doesn't let any through. Save precious lumens and prevent the growth of algae and molds when you line the walls of your indoor garden. Clean Black & White Poly with water or mild detergent.